Macu Marrero is linked to the world of sea navigation. She feels passion for art and tattoos, and in her free time creates stories that she hoping they will be read. Red Zone (Dolmen Ed. 2013) is her fourth published novel and the first one about zombies edited to a writer in the publishing company after Mihai: mi historia junto a un strigoi (published in digital format by Ediciones Babylon) and Señales. She signed her third novel, Los crímenes de Santa Úrsula (Se Leer, 2012), with the pseudonym Greta Spaulding. Moreover, she has been included in several anthologies of short stories like Arkham, relatos de horror cósmico (Tyrannosaurus Books, 2012), which also coordinated No eres bienvenido (La Pastilla Roja, 2013) or Body Shots (Dolmen Editorial 2013). She has also written a syllabus about sailing to obtain the title of basic and leisure sailing captain with lots of success in Canary Islands. 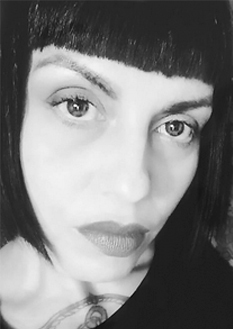 She is member of Nocte (Spanish Society of Horror Writers), she gives workshops of creative writing in the Casa Museo Pérez Galdós and writes articles about tattoos for About.com, which belongs to the group New York Times.